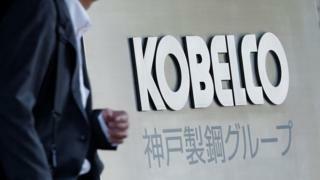 Scandal-hit Kobe Steel has found fresh evidence of mistakes with data on the quality of its products. The Japanese company said it had uncovered a new case of fake data involving steel, and had also halted some copper shipments from a plant. Kobe also said it had found a case of employees not reporting evidence to an internal investigation. The company now plans to set up a panel of outsiders to look into its problems, in addition to the in-house probe. The number of companies that may have used Kobe steel which was not correctly certified is about 500, including carmaker Daimler, aircraft manufacturer Airbus, and the maker of Japan's bullet trains. Among the new cases uncovered, the thickness of steel supplied to customers "was fabricated", a Kobe spokesman told the BBC. "It is not clear how and why this happened. It is under investigation," he said, adding that it "shouldn't be a problem with safety". Kobe said that 3,793 tonnes of steel plates shipped to one customer had the wrong measurements. The company has also stopped shipping about 43% of copper products from its Hatano plant, near Tokyo, because it was found to violate Japanese Industrial Standards (JIS) regulations, Kobe said on Friday. When asked whether the problem of data fabrication could have been going on for more than a decade, the spokesman said: "It could be longer than a decade, we are looking into it now." Kobe Steel also confirmed that an external law firm is helping with the investigation. There is an in-house committee looking into scandal that is chaired by the company's president.